Orbital Sciences' Antares rocket exploded mid-air shortly after liftoff on Oct. 28, 2014. The commercial spaceflight company Orbital Sciences said today (Nov. 5) that the investigation into the explosion of its Antares rocket last week is eyeing the booster's first-stage engines, which were originally built in the 1960s by the Soviet Union at the height of the space race. In a call with investors, an Orbital Sciences representative said the company will likely retire the engines, with the goal of replacing them by 2016. 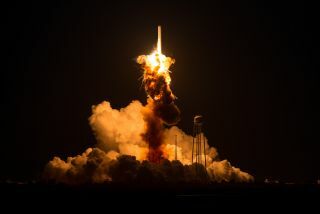 The Orbital Sciences Corporation's Antares rocket exploded just after launch on Oct. 28, destroying the company's unmanned Cygnus spacecraft, which was carrying thousands of pounds of supplies for the International Space Station under a $1.9 billion contract with NASA. No one was injured in the accident. "While still preliminary and subject to change, the current evidence strongly suggests that one of the two AJ26 main engines that powered Antares' first stage failed about 15 seconds after ignition," Orbital president and CEO David Thompson said during a conference call today. "At this time, we believe the failure likely originated in, or directly affected, the turbopump machinery of this engine, but I want to stress that more analysis will be required to confirm that this finding is correct." Orbital has recently come under fire for its use of the AJ26 engines. The parts were originally built for the Soviet Union's ill-fated N-1 moon rocket more than 40 years ago, then later refurbished and renamed by the American company Aerojet (now Aerojet-Rocketdyne). In light of the recent explosion, Orbital now plans on flying missions to the space station using a different kind of rocket and moving up the replacement of the AJ26, Thompson said. Orbital Sciences had been planning to replace the AJ26 engines with different engines for launch by 2017, but now that upgrade is expected to occur by 2016, Thompson said. "We will likely discontinue the use of the AJ26 rocket engines that had been used on the first five Antares launch vehicles unless and until those engines can be conclusively shown to be flightworthy," Thompson said. The upgraded Antares could begin flying missions to the space station again by 2016, he added. Between now and 2016, however, Orbital still intends to honor its commitment to the NASA contract. Instead of using Antares to launch the robotic Cygnus spacecraft, the Virginia-based company is planning to buy space on other rockets. "Taking advantage of the spacecraft's flexibility, we will purchase one or two non-Antares launch vehicles for Cygnus flights in 2015 and possibly in early 2016, and combine them with several upgraded Antares rocket launches of additional Cygnus spacecraft in 2016 to deliver all remaining CRS [Commercial Resupply Services] cargo," Thompson said. At the moment, Orbital Sciences representatives are speaking to three launch providers that could deliver Cygnus spacecraft to the space station. Two of the rocket companies are based in the United States, while the other is based in Europe, Thompson said. Although he did not disclose the names of the launch providers, Thompson said that the companies do have the capacity to fit in some Cygnus launches in 2015 and 2016. Orbital originally planned to deliver the rest of the cargo to the station in five Antares launches, but now, the company will try to fly the rest of the cargo included under the contract to the station in four launches, Thompson said. "By consolidating the cargo of five previously planned CRS missions into four more-capable ones, we believe we can maintain a similar or, perhaps, even a somewhat better delivery schedule than we were on before last week's launch failure, completing all current CRS launch program deliveries by the end of 2016," Thompson said. Orbital isn't the only American company that holds a cargo deal with NASA. California-based SpaceX is also flying supply missions to the space station using its unmanned Dragon capsule and Falcon 9 rocket under a $1.6 billion deal. SpaceX is expected to fly 12 such missions; it has completed four of those flights to date.